Jodie Whittaker: Actress. Time Lord. Fashion Queen of Comic-Con. 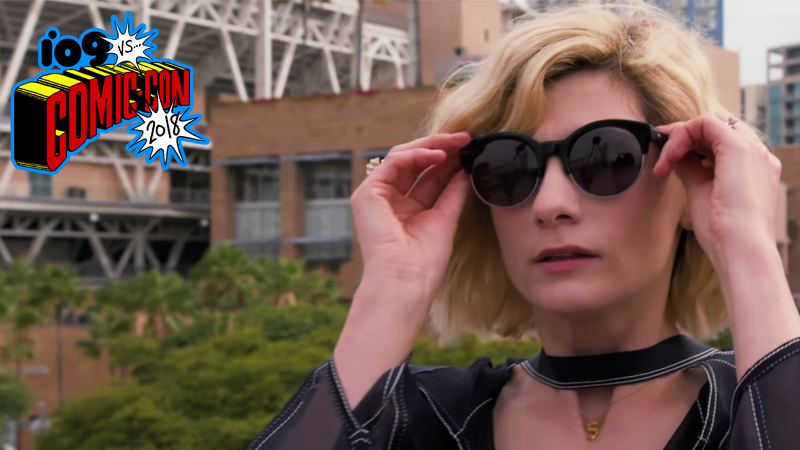 The Doctor herself is attending the 2018 San Diego Comic-Con, and she’s doing so much more than just giving us a spectacular first look at the next season of Doctor Who. She’s doing that and making it fashionable, in the most delightful way. But that’s not all! Whittaker also made a fabulous appearance at the annual Her Universe fashion show at the con, celebrating the best in fashionable fandom creativity. Not only did she walk the runway along with the other design finalists, she did it in costume as the 13th Doctor. Specifically, she was wearing Her Universe’s new cosplay version of the 13th Doctor’s outfit, so she was technically cosplaying herself? Which is amazing. And then the cast of Brooklyn Nine-Nine showed up too, searing an image into my head that this is absolutely a) a fanfic that I have read and b) must become an official crossover. In the intense mania of a hectic convention schedule, this is the life-giving elixir we all need, really.